Men � After competing the last 11 seasons in Marseille, the men�s SWATCH-FIVB World Tour moves north to play in Paris, which is bidding against London, Madrid, Moscow and New York for the 2012 Olympic Games. Marseille has hosted more men�s FIVB events than any other European city and ranks only behind Rio de Janeiro (14). Jan Kvalheim and Bjorn Maaseide of Norway won the first Marseille event when they defeated Christian Penigaud and Jean-Philippe Jodard of France in the finals. South American tandems won the next 10, including nine by teams from Brazil. Mariano Baracetti and Martin Conde of Argentina (2001) broke the Brazilian streak. Marseille gold medallists from Brazil were Emanuel Rego/Ze Marco de Melo (1995), Franco Neto/Roberto Lopes (1996), Guilherme Marques/Para Ferreira (1997), Ze Marco/Ricardo Santos (1998), Jose Loiola/Emanuel (1999 FIVB World Championships), Ze Marco/Ricardo (2000), Loiola/Ricardo (2002), Emanuel/Ricardo (2003) and Marcio Araujo/Benjamin Insfran (2004). Pic (left to right): 2004 Marseille gold medallists - Benjamin, Wacholder, Walsh and Marcio Araujo. Women � For the first time, a city in France other than Marseille will host an �open� women�s SWATCH-FIVB World Tour event. A finalist for the host site of the 2012 Olympics, Paris will stage an international beach volleyball event for the first time. Marseille hosted the women the last eight seasons, including the 1999 FIVB World Championships where Adriana Behar and Shelda Bede captured the title. After women�s teams from Brazil (Adriana/Shelda, 1997 and 1999, and Sandra Pires/Adriana Samuel, 1998), five different tandems from the United States captured the Marseille gold medal (Annett Davis/Jenny Johnson Jordan, 2000, Barbara Fontana/Elaine Youngs, 2001, Holly McPeak/Youngs, 2002, Misty May/Kerri Walsh, 2003 and Walsh/Rachel Wacholder, 2004). Ethel-Julie Arjona and Virginie Kadjo posted ninths (2003 and 2004) for the best finishes by a French team in Marseille. 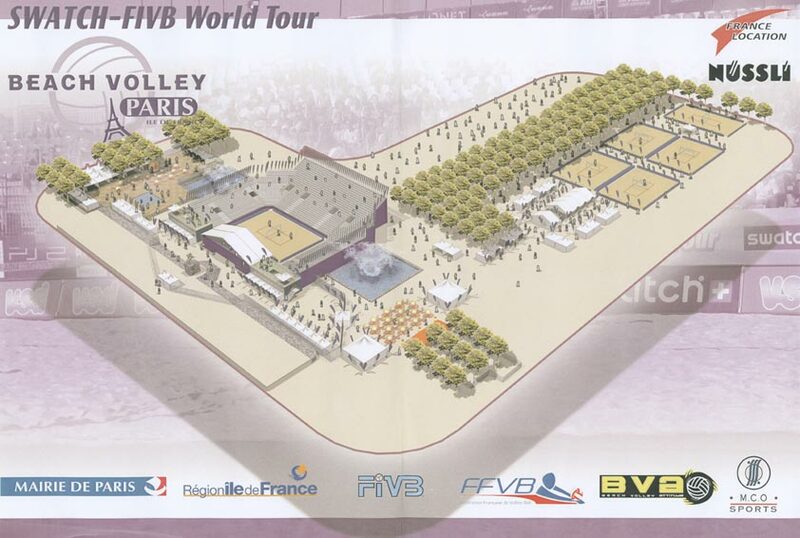 France has also hosted three FIVB challenge events the past two seasons in Lavandou and Porticcio.